Little Debbie, and Lucky Penny hiding behind Lil D, Shebot, and her hardy sister, Kamen. 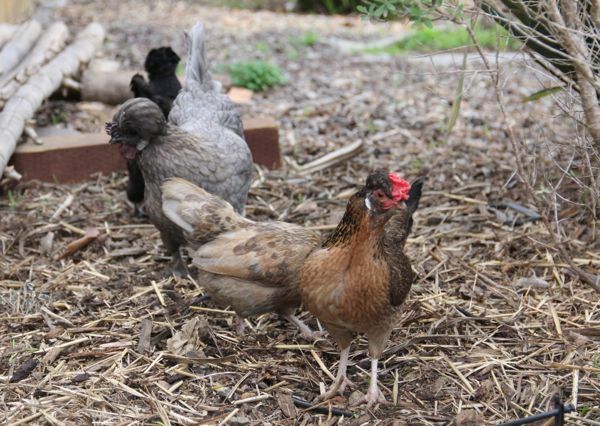 These four are the laying hens. 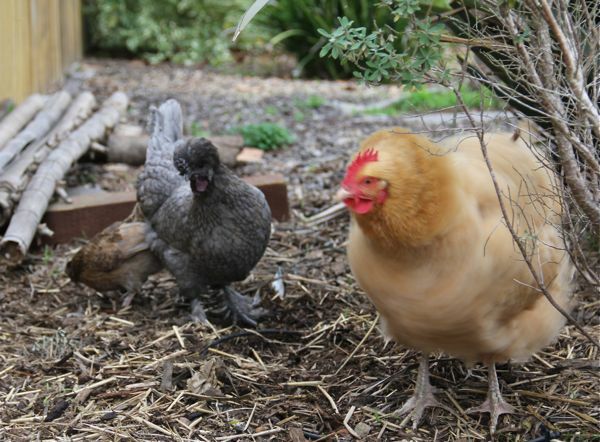 Two little bantams, and two Polish Silkies. Betty is our dowager, the hen we've had almost five years. We call her Lady Betty Orpington. I cannot get used to there only being five chicas in our garden. I miss the ones we've lost. I miss Zoltar, the mighty cocky little dude. I miss the Silkie Sisters, Zelda and Puff. I miss Zoe. I miss Trudy, and Rosie, Luna, and Gracie. Betty, mid-shake, loosens her feathers while out on parole. When we lived in the country, in our rambling Rancho, our three chicas, Rosie, Luna, and Gracie, had free rein of two acres. They ambled and roamed, and foraged happily. I knew about the hawks, the coyotes, the bobcats, and skunks, even the feral cats that would show up and do their harm, but nothing ever happened to those three. And they were tame. 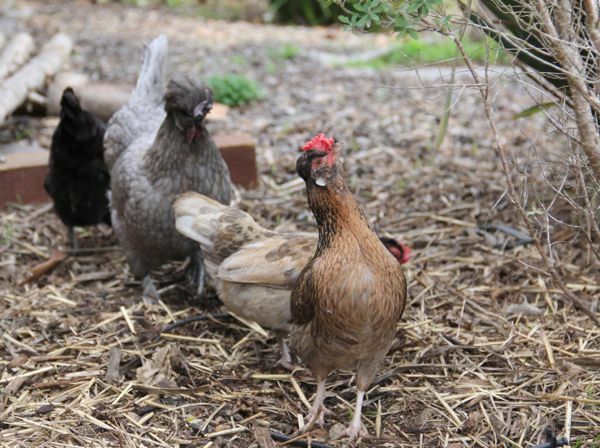 I have never had friendlier, milder, more docile hens, than those dear chicas. They always came when called, and Gracie... she would sit in my lap, to be pet, and she would nod off, like a content kitten. Everything about having those original chicas was easy, fun, silly, confidence building. They made feel not only like a real farmer, but like a real good farmer. I have always tried to keep it real, when sharing about keeping chickens. When I was being an outlaw, keeping chickens in a rental house, in a very suburbany neighborhood, it was stressful. Stressful, but fun, and I was never too deterred. I enjoyed finding solutions and making do with whatever new obstacle popped up. And whenever anyone asked about "keeping chickens," I was quick to encourage, happy to persuade, because I could not think of anything too difficult about making hens happy and safe... it just seemed so very easy. Was I naive? Were we darn lucky? Yes and yes. I did take precautions, and I did adapt to improve their circumstances, but I never came up against anything, or anyone, that really stood in the way of keeping our pets happy and safe. Until this last year. What a year. Bobcat. Coyotes. Hawk. Weasel. Raccoon. Our poor bunnies and chickens have been stalked and hunted, and every time I thought I had got the upper hand, something new reared its hungry head and proved me dead wrong. Losing our pets has been sad, and humbling, and nerve wracking. I have this anxious dread that wakes me in the night, and a constant feeling of unease about the safety our chicas. It is painful to admit that for the first time in my chicken keeping life, I am unhappy keeping chickens. I still love them. I still think they make wonderful pets, but I feel like I have failed them, and this realization takes away a great deal of my peace of mind and chicken joy. Oh shoot... that was no fun to put into words, but there is some relief in saying things out loud. Maybe things are looking up. Our chicas live in the Casa de Rabbit where Sanka lived. The three levels create more space than the sixteen square feet of the garden bed. They can roost, they can hop up to the overhanging shelf. The ventilation is good, and they have deep straw and dirt to dig and bathe in. We double wired the chicken wire, and have three locking systems on the door. It's tight. Every few days, in the late afternoon I open their home, so they can run around the yard. I am wary of the hawk. He took puff, and he attacked Shebot, so it's a problem. But I know that they love their freedom, their garden sojourns. When they are out, it's like they are on parole, but I like to think it is better than nothing. Soon, as soon as possible, we will build a new enclosure. It will be something that answers all the issues and known threats, so the chicas we have can be safe, and happy, again. Our latest system is good... good enough so I can sleep at night, but I am looking forward to making our plans a reality. And the goats... well, since the chicas vacated the shark cage, the goats have moved up and in, and are living happy and safe in their new space. Here they are, leaning in for their molasses and oats favorite treat. I kid about them leaning so far forward on that little fence that they pull down the barn! 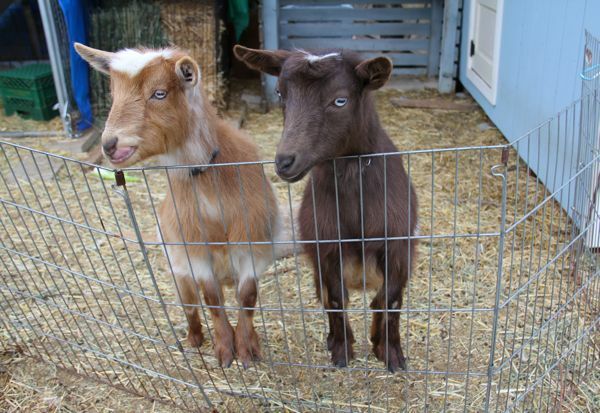 Goats! Just what I needed on a rainy Friday. You just made my week with the photos and writing, it was like a double dose of chicken love! I as a pet owner understand the feeling of letting animals down - same feelings, just cats not chickens. Consider this. Had they been with someone else, they might have never had the life they had with you, you were blessed enough to have known and loved them. Some of the ways they leave us feels like huge scars in our hearts - remember Logan leaving me in January/February? But as you said to me then, time does help. I too feel like I let him down, but I loved him with everything I am, and still do. And I think that was gods plan, to show us how to love them. And I think you passed with flying colors! Jenny, you gave me the nudge... thank you. that you are well... super well! What lucky animals they all are to have you looking after them. You're doing a great job! Hahaha... yes! We need a robot coop patrol! Here's to a safer year for us all, and our dear pets!